Our blogger Dikla Rivlin-Katz believes that the main message of Chanuka is about positive thinking. “If I had been Judah the Maccabee, I wouldn’t have even tried to light the menorah with oil left for only one day. It wouldn’t have occurred to me even to try…” For more, click here. The many contradicting responses to the breakthrough/deal/capitulation over Iran’s nuclear capabilities sometimes seem like more of a portrait of the writers’ states of mind, rather than cold analysis. The Chanukiah itself has much to teach us of this battle between optimism and pessimism. For more, click here. 3. What if Chanuka were in May? Much has been made of Chanukah’s meeting with Thanksgiving. But what if Chanukah were by some freak hole in the cosmos to happen in May? 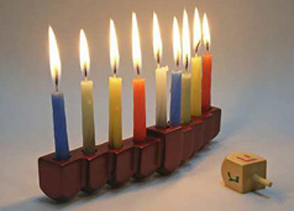 Then we’d find an even more fruitful comparison – between Chanukah and Yom Ha’atzmaut. Both festivals are celebrated outside and inside of Israel, and both mark a historical event that took place in the land of Israel. One difference is that while Chanukah has found harmonious and inspiring rituals that engage the family home and the community, Yom Ha’atzmaut continues to find itself struggling for a consistent place at our hearth. For more on comparisons between Yom Ha’atzmaut and Jewish holidays, click here. 4. Whose side are you on? The latkes (levivot) have it. As we mix and grate, fry and chew, we know in our hearts that the flavors are in the complexity. Chanukah mixes the pure and the impure, the war and the miracle, the doing and the hoping, with enough and never enough. If for no other reason, this might define it as perhaps the ultimate Israeli festival.